So with colder weather coming in I started getting itchy to make something. I got up Saturday morning and finally started cutting up the beaver pelt picked up in Duluth last February on the way home from the Beargrease. Finished the last few stitches last night, and am very please (and a bit surprised) with how they turned out. Like all my DIY gear I may make a few little adjustments down the road after a bit of use, but they are ready for testing. 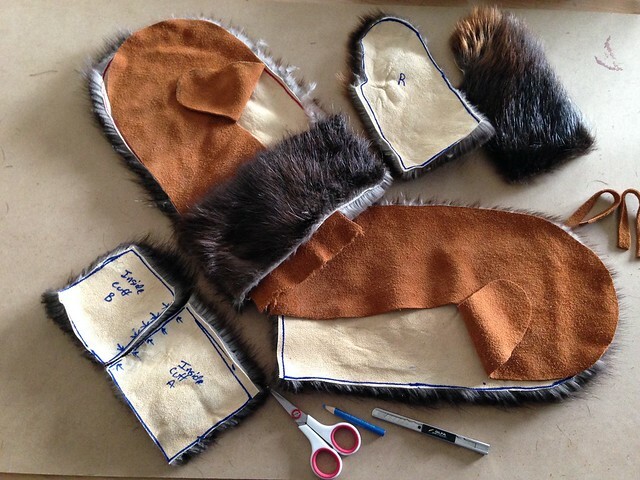 I made a heavy duty pair of mittens last winter out of moose hide and canvas (https://www.wintertrekking.com/community/index.php?topic=4744.0) with a wool liner, and they turned out great and did great in the cold, so I really wanted to make a fur pair pretty much the same way. I really liked the way my moose hide ones were sized to let me to wear my favorite insulated work gloves inside, and allowed me to slip them on and off easily. The wool I had available for the liners of my fur mitts was a little thicker (left over from my DIY anorak), so I added about half an inch to the size of my old pattern and made a new, slightly larger one. Also I planned to have the fur as a guantlet instead of canvas, so made some adjustments there too. Before I started cutting, however, I took the new pattern and used it on some fleece to see if it worked. I actually found the thumbs were not quite right, so made a couple adjustments to the pattern and checked again. Much better to make a mistake on the fleece than the fur. The new pattern just barely fit on my beaver pelt! In fact, I could not get both inside cuffs from one spot, so had to find two places with good fur and sew them together. When I made my moose hide mitts, I had been glad to find that my old Singer sewing machine could handle the moose hide, but I had no such luck with the fur. I tried twice to sew the two inside cuffs together, and it really did not work either time - and that was an easy, straight seem - so I could see I was going to be hand stitching almost all of these mitts. I've seen it done both ways, but I chose to have my fur flow toward my fingers rather than toward my elbows. I probably see it this way more often, and that's how my book Secrets of Eskimo Skin Sewing by Edna Wilder says to do it. I also figured it make sense to have as much fur a possible over the fingers like a ruff. The hole point of these things is to protect my fingers. After all, I've never noticed the middle of my forearms getting cold. For cutting the hide, I used an an Exacto knife with fresh blades. You have to take care to just barely cut through the hide and not get any of the inner fur on the other side. I used a small glover needle (leather needle with three sided point rather than round like a regular needle) and Gutterman 70 thread. I chose to use a double strand of thread to give it a bit more strength. This worked well, but because of the small needle hole, the two thread tend to twist a lot as I pulled it though and would often get knotted up before it made it all the way through. The twisting also tended to catch the fluffy inner fur and try to pull it through. It was CONSTANT battle to get the thread through cleanly, and it took a lot of time and patience but it did work. I also found I got much better at it and at controlling the fur after about 5 inches of sewing. To help hold the two pieces together (either fur-fur or fur-moose hide) I used binder clips as shown below. They worked great. I'd try to set them so I had about an inch of exposed hide to sew at a time, then would remove or slide the clip further down. Managing that fur was also a constant battle, especially when going around the finger ends where the guard hairs were hanging down. I used my fingers mostly, but often use the back edge of a seam ripper to gently help push the fur back away from the seam. As seen in the photo, I tended to start my sewing about a quarter inch in from the end, moved toward the end, then back over the starting point the other way. I ended threads this way to to hopefully give it added strength. I started by stitching the cuffs to the thumb pieces (if I had had the space, I could have just cut them this way but it did not fit), then I stitched the thumb/cuff piece the the back. Making this pattern work is all about getting the thumb right. I would start each at the "thumb notch" and work out from there. Before sewing I marked a little dot on the side of each hide every 3 inches or so to make sure they were lining up as I went. Sometimes they would get a little off, but its easy to correct with a little pulling here and there. I sewed one complete mitten first to see how it worked before starting the second. I found the first one turned out a little wider, roomier than I expected, even with the liner in it, so I trimmed about 1/3 inch from the other pieces before starting. This means my right mitt is actually a bit smaller than my left mitt. I may go back and cut a little out of the left mitt if it seems too wide, but that is for later. The next to last thing to do were to stitch in a small loop made from moose hide at the top of each cuff. These are for hooking to a harness so I can flip them behind my back while working with something in my work gloves, but will also help to hang them to dry if they get wet. Finally, I cut a piece of ribbon to go on the outside and stitched the wool liner, the hide, and the ribbon all together with a line of stitches along both edges of the ribbon. Thank goodness I found I was able to do this part on my sewing machine, though it did fight me all the way. To help get the ribbon in the right place, I did trim back the fur about 1/4 inch from the edge. I did not trim the fur back on any other seams. With the wool liner stitched in, it will be easier to get my work gloves in and out. If I have to dry them, I can simply pull them out of the fur part to expose the wool to the air, though they will still be attached. So now I have to make a harness and wait for the real cold to test them out. I may as I said above have to go back and rip out part of the lower seam on the left mitt and cut away some of the fur and hide to make it a bit smaller. Also, I am considering adding a 1/2 to 1 inch strip of coyote fur around the inside of the cuff, the idea being to help keep heat in when I twist them behind me, and also to help keep any falling or drifting snow out. I guessed coyote might be better as I 've got some bits with longer, less dense hairs. These can be decided after a bit of testing. Now bring on the snow and cold! The moose hide was a split I got from Centralia. The wool liners were came from a JNA/Yugoslavian Army blanket I got at the surplus store in Ely and use for my anorak. The beaver I picked up at USA Foxx in Duluth after flipping through several rings of hides. I asked, and they said the pelt came from near Cook MN. So one night on my last winter trip, on a whim I decided to set my GoPro on a tripod in front of my stove to record the fire as it was lit. After a couple minutes of the fire starting to burn, I adjusted the tripod a bit, lowering it so it was slightly looking up a the fire - a perspective I never see while sitting next to the stove. At home watching the video, I was amazed how much of the flame was going straight up the stove pipe. Admittedly, the door was open, the wood was piled back a bit and was just catching vs being a bed of coals. But it still made me realize how much a baffle would help to keep more of that heat inside the stove. Just thought I would share that. Now to start looking at some of the modifications folks have made to their Kni-Cos. I've been a busy beaver with my sewing. Realizing one of the areas of my winter outdoor kit that was wanting, I decided to make a pair of oversized mittens for the more serious cold I was likely to encounter. I created these oversized, lined gauntlet mittens to fit over another pair of gloves or mitten liners like my Dachsteins or insulated work gloves (shown), and so far have been wildly happy with them. 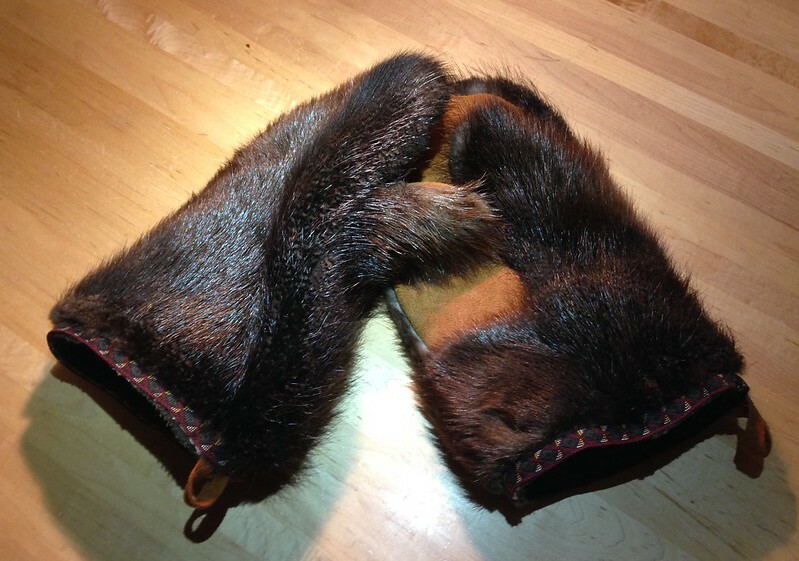 Last winter I ordered a couple of moose hide splits from a supplier online. I was reluctant to buy better quality leather without having proven what I was attempting. I had messed around with mitten patterns with some scraps of fleece and extra scraps of wool, and was happy with the mitten pattern I was working with. After putting it off for a while and with two winter camping trips coming up, I finally started tot trace and cut. Having cut the moose splits into the pattern, I was fully anticipating stitching by hand with glovers, but decided on a whim to try stitching on my old 1954 Singer sewing machine. I didn't realize at the time that there were leather-specific sewing machine needles so use my regular 11/80 needle. I was a bit surprised but the machine punched through the leather, sometimes with effort, but reliably. After stitching the leather, I just rough guessed the size of some guantlets and cut from some 10 oz. canvas. After an adjustment or two, I stitched on to the leather, then sewed up the seam and added some bungy-draw cords at the end of the cuff. Lastly I took some extra wool left over from cutting up an old overcoat (about as thick as my 28 oz Codet trousers, maybe a bit thicker), and made a pair of mitten liners to fit inside my oversized mitts. I originally planned to keep them separate, but realized that with my goal to be able to fit a pair of insulated work gloves or heavy mitten liners inside these mitts, the wool liner would have to be stitched into the mitts themselves. I stitched them in at the wrists, which makes getting another glove/liner in and out much easier, but also allows me to pull out the black liner from the leather to speed drying if needed. Lastly I added a draw cord just in from the wrist. Being oversized, I really needed something to help keep the mitts on my hands in the correct position so added some Velcro synch straps at the wrist. I tried these mittens around home walking my dog and the seemed very good either with or without liners. 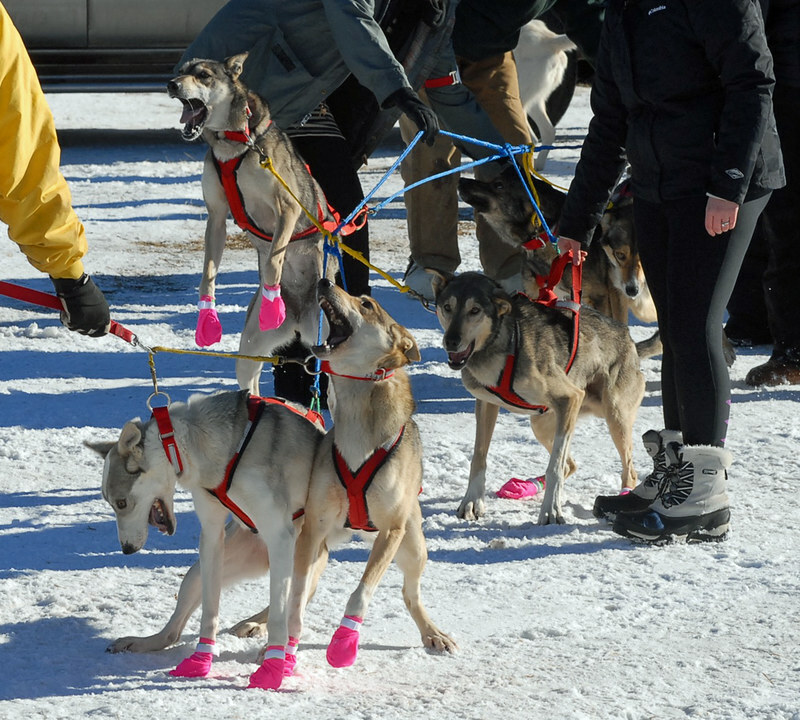 Then about two weeks ago I gave them a good workout while working at a checkpoint at the dogsled race. Worked absolutely great in extended below 0ºF cold, and allowed me from time to time to toss off to the side while I worked in my favorite Wells Lamont insulated work gloves. Very pleased with how they turned out. Now wondering about making a pair with beaver fur. 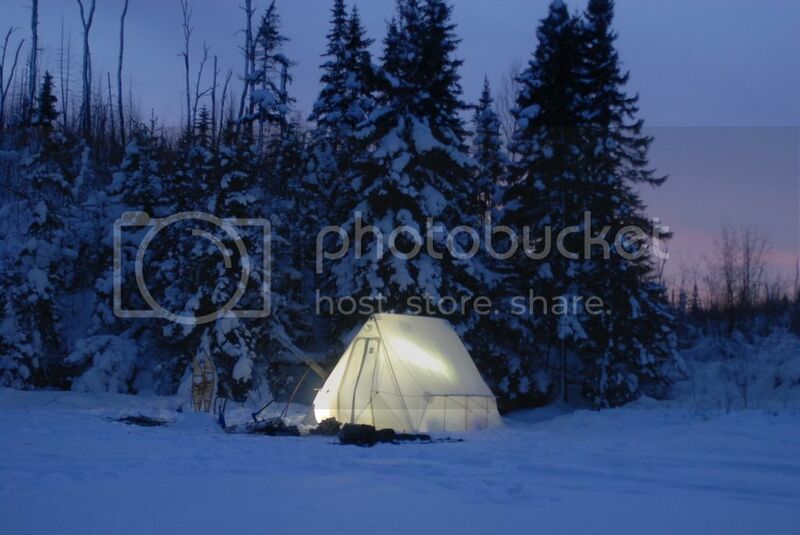 General Winter Camping Discussion / Happy 150th Birthday Canada! Happy Canada Day, and happy 150th Birthday to our fine neighbors to the north (or to the east for y'all in Alaska). Well done, Canada. I don't believe those of us from below the 49ºth could hope for a better neighbor. 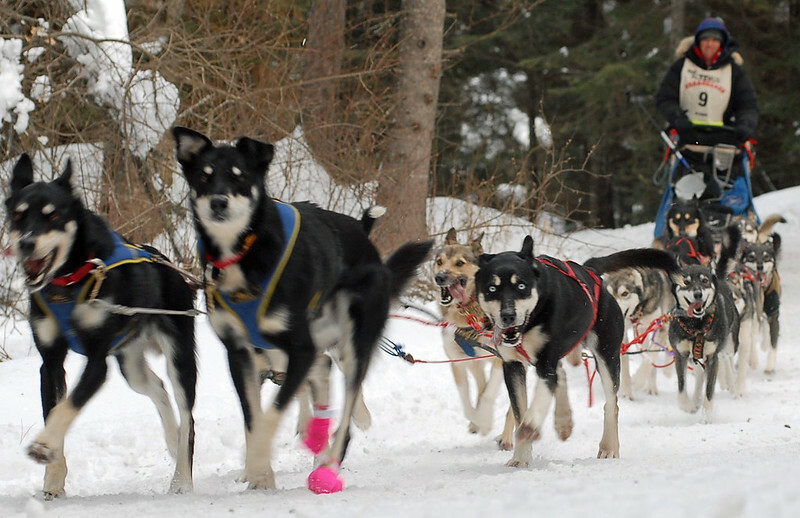 In case anyone is in or could be in the neighborhood, the doggies will start running in Two Harbors on Sunday at 11am with teams going out for several more hours, and will keep running for a few days. In case any folks in the Thunder Bay area are interested, but race course has changed and goes into Grand Portage just an hour or so away. Teams will start arriving there Monday evening sometime, and be heading back down toward Duluth early the next morning. Here's some of the visitor scoop. http://www.beargrease.com/fanraceinfo.htm. Last year i set up my tent and hung out at the Sawbill Checkpoint for 4 days and had a blast. Not sure yet if I'll be able to or not, but very much hope so. Slushwalker - you heading up there this year?? I was thinking of getting in one last soft-water trip this weekend using my hot tent, but see that some strong winds are coming into my area with gusts into the mid-40MPH's for about 24 hours. I've used my Snowtrekker/Kni-co combo with an extra elbow joint on the end of the pipe in some decent winds maybe up to 25-30 mph or so with not trouble, but am wondering what people have experienced in the 40+mph zone? Obviously, setting up in some sort of sheltered area would be the first defense, but is not always possible. Are there any other tricks for helping to keep the fire going and the smoke out, or is there a point where the wind just wins? This is probably a long shot, but has anyone tried to modify an ice auger to reduce weight and make easier to pack? I have a Strikemaster Lazer 4 inch, and while at 5.5 lbs isn't terrible, I can't help looking at it wondering if I could do anything to make it lighter or easier to pack, or are there better options out there. Maybe cut down the shaft portions, or even use a blow torch to remove part of the curly portion - most of which seems unnecessary? Any thoughts? I'm not interested in switching to an ice chisel. I know it would be lighter and smaller, but with solo tripping I'm not interested in adding to my camp set up time, and it would make harder to drill multiple holes for fishing. 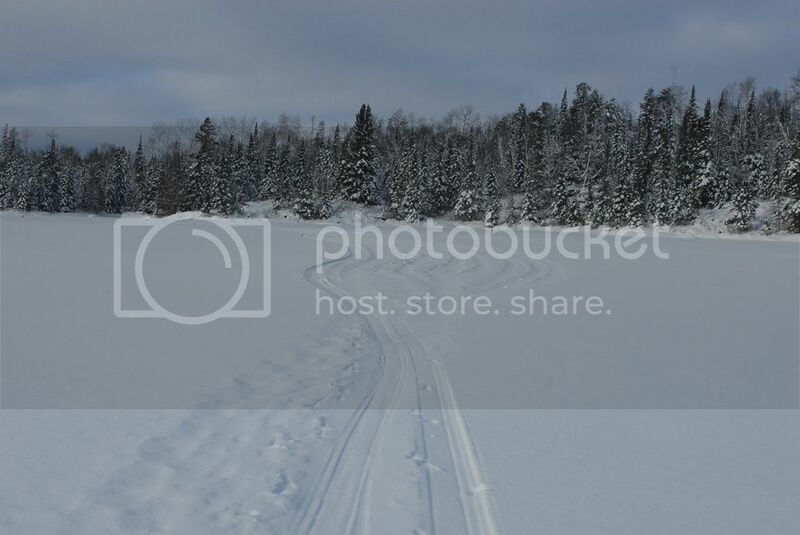 Last week I spend 5 days camped out at the Sawbill Checkpoint for the John Beargrease Sled Dog Marathon just outside Tofte Minnesota and close to the shores of Lake Superior. I've visited the Sawbill Checkpoint on a couple of prior races but only for a short time and always missed most of the action, so this year I drove up a day prior to the race start and was really able to be part of it. Admittedly this was no deep wilderness adventure. 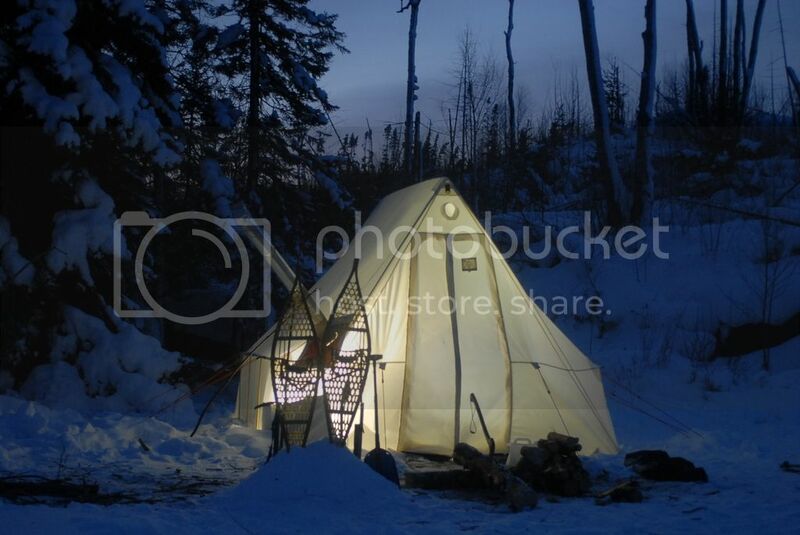 I did use my toboggan to haul in gear, I did rely on wood I gathered to fire up my stove, and there was no cell-phone coverage. My car, however, was just 150 yards from my campsite, and on two evenings I opted to drive 15 minutes to the local bar for a burger, pint, and wifi access rather than cook my own food. Still, I was camped out with my tent and stove in Minnesota's great north woods just south of the BWCA and the Canadian border. It's my belief that all time spent outside is better than all time spent inside. Next month I'll try to push my limits on an adventure - this month car camping is just fine. And car camping means a few extra luxuries can be had. Camp set up went swimmingly, though it was a bit warm at about 35ºF. I was pleased with how easily the snow stakes (pegs) I recently purchased to anchor my tent guy lines went into the wet snow - though would be frustrated 5 days later when I tried to dig them out. This was definitely a case where wooden disposable stakes would have been better. One advantage of the warm weather was it made it easy for me to "sculpt" a holder for what I now call my "snofa" - an 4 foot insulated folding bench I that I whipped up from scrap the day before heading up. I just threw hinges on two 4 foot by 15 inch chunks of plywood, and glued some rigid pink foam to the back for insulation - and combined with a thick carpet over the top I had a very comfortable place to lounge for the next several days. I will never happily sit on a milk crate again. My blanket covered folding chair may have looked good but didn't really work as the legs kept sinking into the snow. 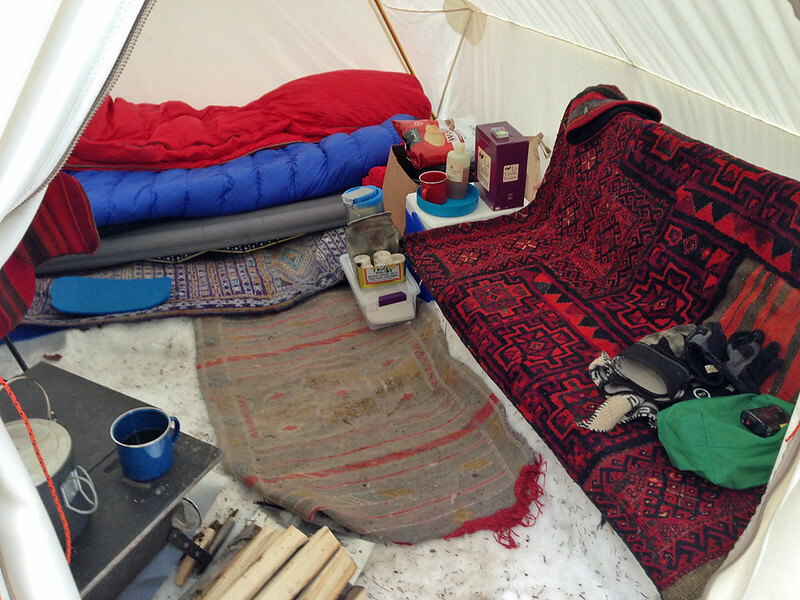 Overall, however, this was probably the best, most comfortable camp set up I have ever had - at any time of the year. In addition to the official checkpoint volunteers, there were several other canvas hot-tenters who showed up to hang out and watch the race events. Shortly after I had my camp set two neighbor campers stopped by to say hello, and I was a bit caught off guard when one saw my olive-oil can candle lantern and more or less said "are you on Wintertrekking.com? Are you Jawax?" Ugh, yeah, that's me! Turns out is was Slush Walker! Of all things to be recognized by an empty olive oil can! Surprise aside, I was very happy to meet Slush Walker and we stood side by side helping steer dog teams off the road and onto the trail until well after 3:00am one night. Very happy to get to know you, Slush Walker. Any photos to add? I know there are several active members on this forum who run dogs for recreation, racing, tourism or trapping. I hope you will add comments or corrections as you see fit. I have to say I have been mesmerized since the first time i saw racing teams getting set up to run. I could not, and still can not, fully understand the unbelievable urge they have to run. I dare say, no human I have ever known or are likely to know, will ever wake up after a short nap with such a fierce urge to get to work that they must be physically restrained. If I possessed a fraction of a sled dog's spirit to work, I would in but a few years make Warren Buffet look like a poor man. 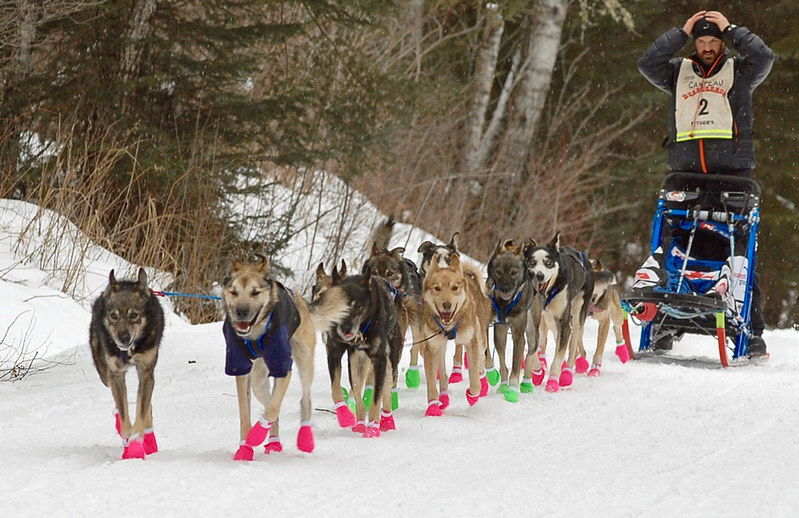 I am also in awe of what the mushers on long raced go through. I've never been very good with sleeplessness, but it seems to be a key competitive variable in a longer race. 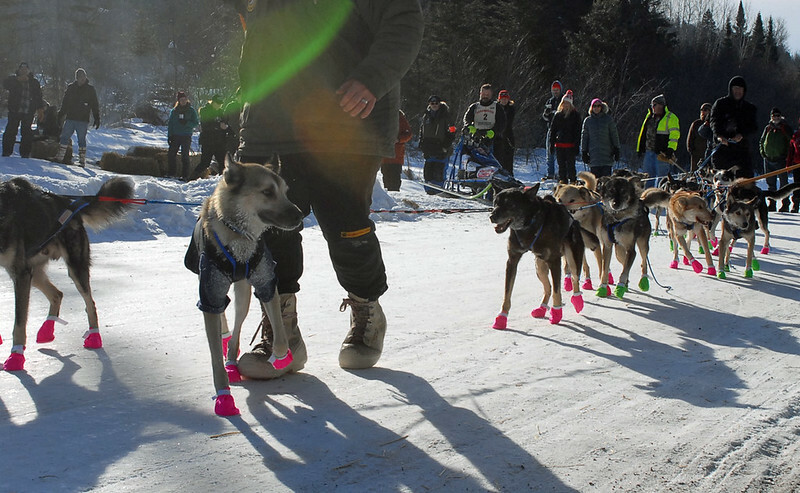 The Beargrease, for those unfamiliar, is about 380 miles long, is an Iditarod qualifying race, and is the longest race in the lower 48. Overall it was an amazing and unusual year to be at the Sawbill Checkpoint. As usual, all of the Marathon (380 miles) racers came through, and then after a loop cam back dow toward the finish line a day or so later. 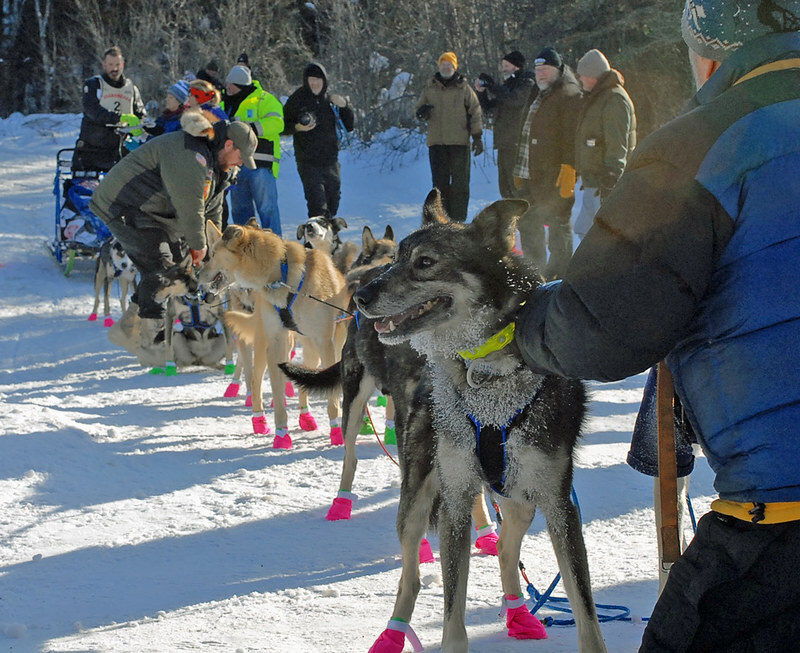 In addition, because the race start was moved north from Duluth due to snow conditions, all of the Mid-distance racers came into and out of Sawbill as well. It was a very busy place from about 5pm to almost 4am, and then after a day's break, got busy again with all the downbound marathon teams. My Canadian cousins, your folk were well represented in this race. Newcomer Jason Campeau set a very early fast pace, and ended up coming in just second to 4 time winner Nathan Schroeder. 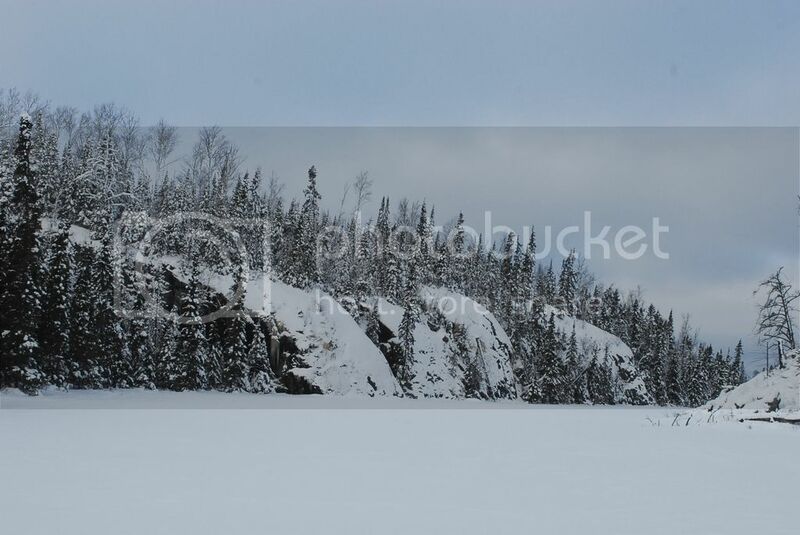 Jason was an Iditarod finisher, and former professional hockey player. Quebecois Julie Albers ran, and Carl Routhierr finished his first Beargrease and won Best Kept Team. 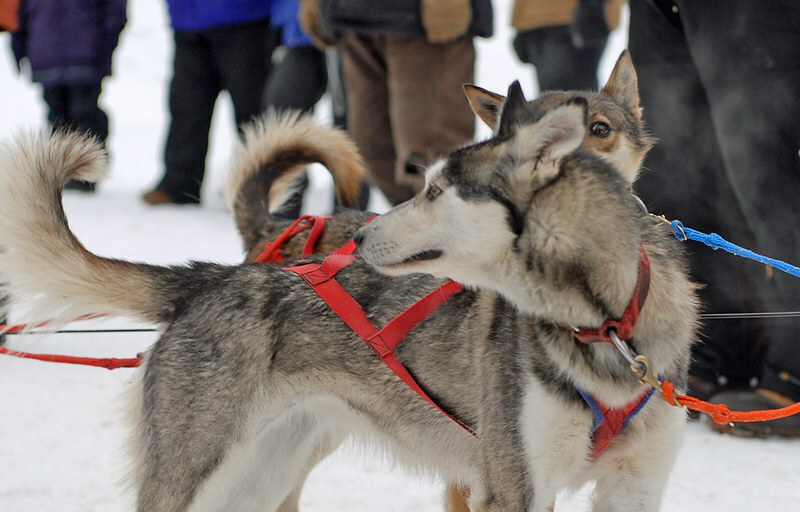 I was at the finish when his team came in, and was amazed at how gentle and calm his dogs were after a 380 mile run. It was an amazing experience to watch all these teams start, run and finish this race. It's just an amazing display of endurance, dedication, will, and passion. If you have never seen such a race up close, I suggest you have a watch. If you, like me, are always looking for another reason to toss your tent up and do something in winter, I'd suggest you contact a race volunteer coordinator in your area as each race is always looking for more people to help manage starts, finishes, checkpoints, and road crossings. Overall it was a terrific 5 days, with some traditional camp stuff like heating water and processing firewood, and some more dog oriented. On the last day after getting most of my own camp broken I helped tear down parts of the checkpoint - like restacking unused firewood, hauling unused bales of hay, or dropping and folding the gargantuan Snowtrekker tent. I was the last one to leave the checkpoint and head south, but I ended up not getting far before one last stop before heading to watch the last finishers. At the mouth of the Temperance River just south of Tofte, I found what I had hoped to see with a northeast wind - waves. 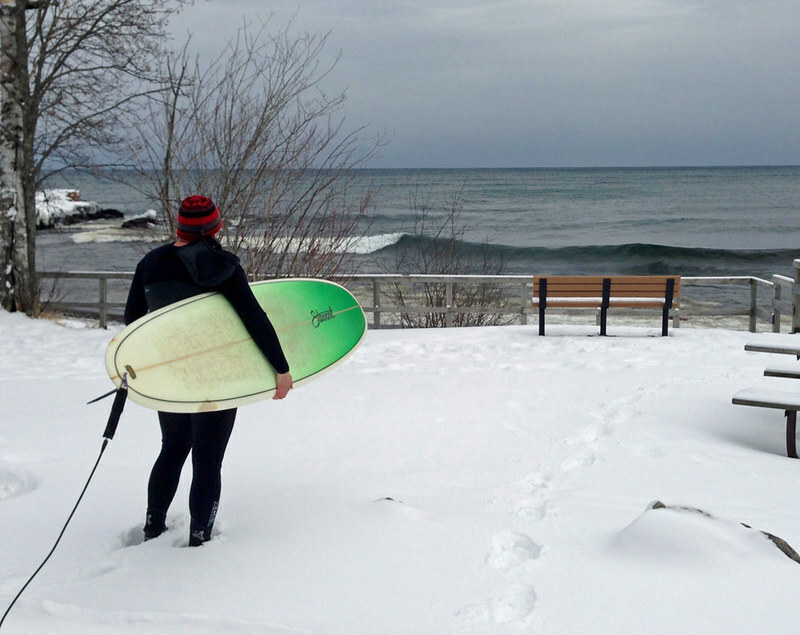 As if winter camping isn't odd enough, I anticipated the winds and prepared for one of my other favorite north shore pastimes - surfing. Waves were moderate, but more than sufficient as my skill level has waned in the past few years, but it was amazing to paddle out as a way to finish a winter camping trip. After a few waves, it was back into my parka, wool pants, and mukluks, and down to Billy's for the last finishers and a pint. I'm already looking forward to next year's race. The normal starting point in Duluth has been moved due to minimal snow, and will now start near Two Harbors instead. More importantly, I've noticed that the northern part of the race has been redirected - after marathoners check in to Trail Center Lodge on the Gunflint Trail, they head east over to Grand Portage to a checkpoint, then back down towards Duluth. Schedules can vary, but they have estimated that marathon teams will be in to the Grand Portage checkpoint somewhere (probably) between 3pm and midnight on Monday. Makes the race more accessible if anyone in the TB area has an interest! I also noticed the shorter mid-distance race will be running all the way up to Trail Center this year instead of ending in Tofte. i'm planning to get up there and watch, and probably camp out somewhere near the Sawbill checkpoint. See ya out there. 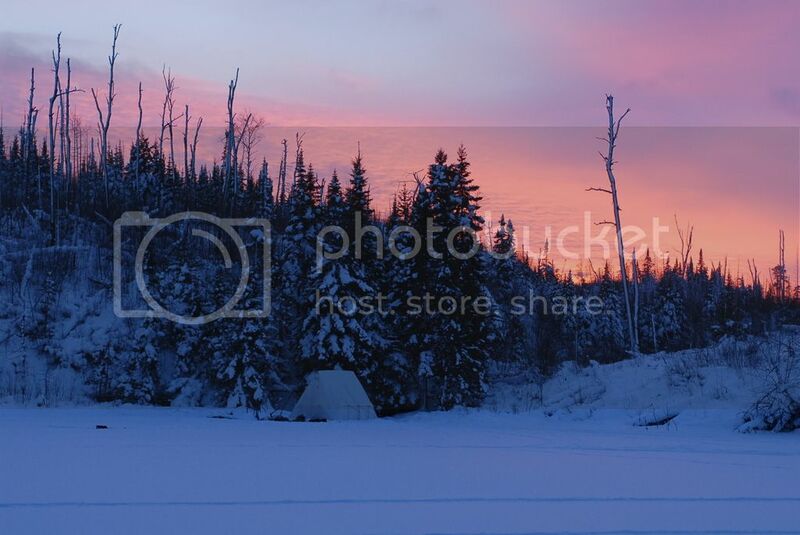 This year I spent New Year's Eve and the first week of the new year solo camping in the BWCA of northern Minnesota. I entered at Round Lake and travelled the northern loop in hopes of getting to Gillis Lake for the start of Lake Trout season. With such an unusually warm December, I wasn't sure what sort of ice conditions I might find. I knew from webcams that some of the larger lakes on the other side of the Gunflint Trail had only iced over the week before, and as I drove past Trail Center Lodge just a few miles south of my starting point I passed a large hand-painted sigh by the side of the road reading "Ice Not Safe". Hmm - maybe this trip would get cut short. As I started across Round Lake and the first portage I realized there had been another group of at least 4 or 5 sleds sometime before me. I could see where they had hit slush pockets and fanned out, but fortunately for me and despite mild temperatures the slush had frozen over and I encountered none for the first two days and very little after. As it turned out, the ice on the smaller lakes was in good shape and generally 6-7 inches thick. I eventually did make it to Gillis, but had been told by other nearby campers that the ice was had been a mere 2-3 inches just days before. I walked along the edge of Gillis just feet from shore and heard lots of creaking and groaning, so retreated to Bat for my lake trout efforts. Bat had a good 5-6 inches. This was my first trip with my newly crafted toboggan and I was eager to see how it would do. After using a Paris Expedition, I was pretty amazed how slippery it was. Sadly I think I expected this and overcompensated by bringing about 20 pounds of unneeded gear and food. Live and learn. 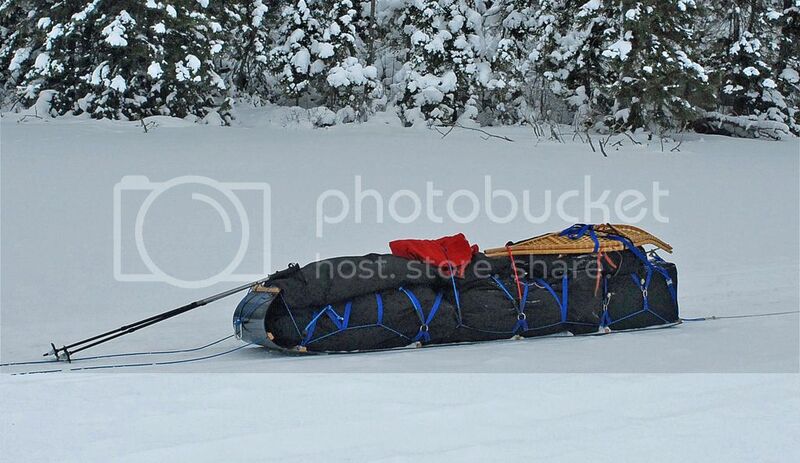 Overall I really did like the toboggan, but found my lashing system a bit fussy. I am going to rethink it and make it more modular. I also was trying out newly a newly finished sled bag and Connover type bag. The Connover worked well, but I found I did not like the single sled bag concept. I think I'll modify it to be 2 or 3 separate sections which will help if I encounter formidable hills where I may need to haul partial loads at a time. While I had hoped to make it to or near Gillis to camp by the second day, I decided to base camp on Brandt instead and hike in to Gillis or Bat since I was not sure at that time of the ice conditions and the portages were pretty steep. The area on Brandt had been mostly burned in the big Ham Lake fire in 2007, so I found a pocket in the north west corner protected from the wind by a hill and small grove of black spruce (I think). 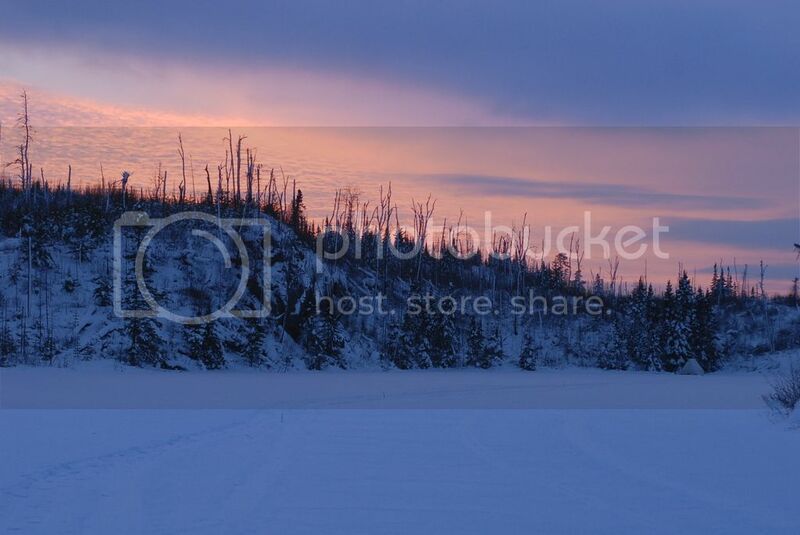 Sunset as I was returning to camp from exploring. With Luci Light on, just before lighting the evening fire, but one more look at the sunset first. I had been inspired to try baking something after seeing Mizmoosie's trip report not long ago. Though i do not have a real oven, I thought I could make something work. 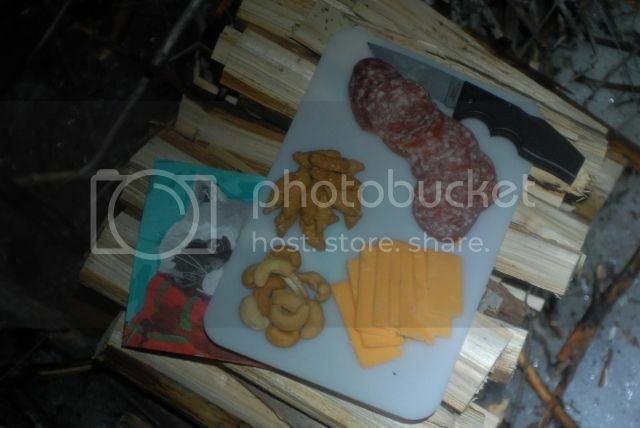 I first tried baking in a frying pan on top of the world stove with an oversized cover, but this did not work well. I tend tried directly in the stove and had success. To do this I first pushed the most of the fire toward the back of the box and put two larger splits in the bottom about 5 inches apart, then pulled some coals back in between them. 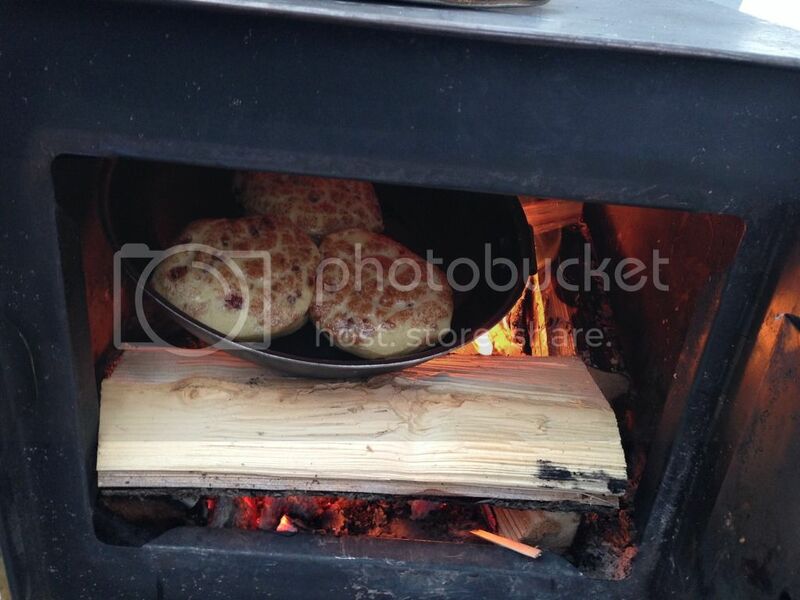 Then I put a cross layer of splits on top of that, and put my covered frying pan in with my cinnamon rolls inside. This provided enough heat from the bottom but more from the top and worked great for the 12- 14 minutes needed. In two days of trying I sadly must admit to no lakers, but it was my first try at them through the ice. Maybe it was me, or maybe there was too much light with the modest ice and snow cover. I found a couple of other fisherman found it a bit slow too. I'm sure it will be better soon. 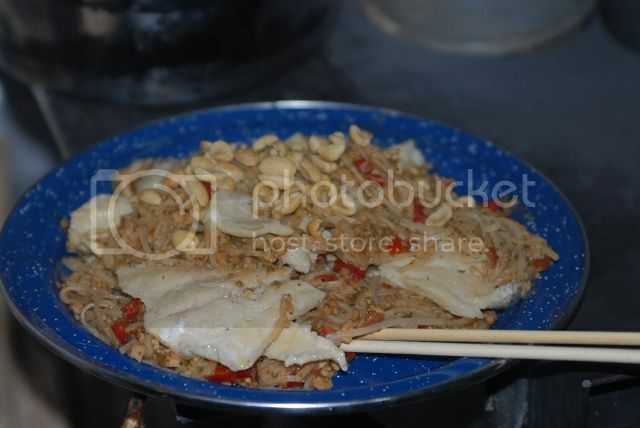 I did manage to find a nice sized northern pike back on Brandt though, and incorporated it into my evening Pad Thai. I spent last week camping in Minnesota's Boundary Waters (BWCAW) just off the Gunflint Trail, and found myself wondering about the "burnability" of some of the types of wood I harvested for my stove. I found that 2 or 3 of the trees I used seemed to burn substantially less well than most of the others. They were all 4-6 inches in diameter, and sawed and split the same way, but a couple of these guys would only burn well if added to an already hot fire. 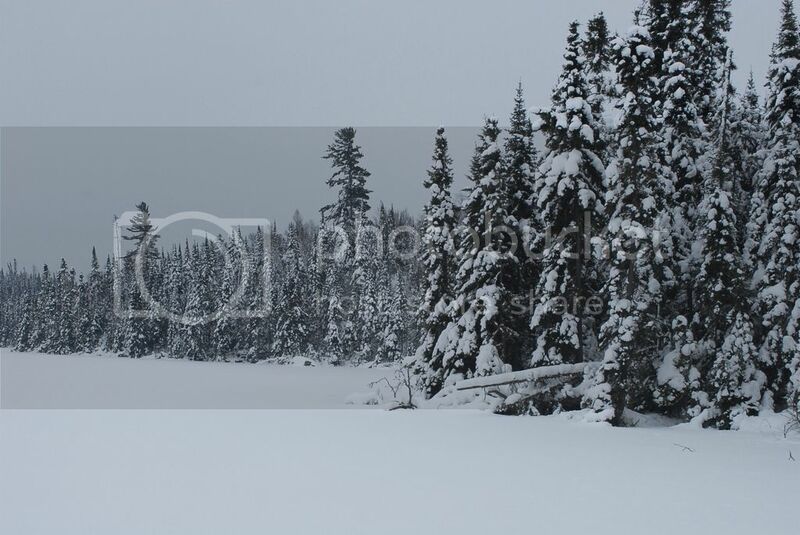 All the trees I took were dead and down but all were off the ground held up by branches or other trees (can't take standing wood in the BWCA). The area I was in was heavily burned in 2007, so I suspect all these trees died at that time or shortly after - seemingly plenty of time for wood to dry out. All the trees were conifers (I'm pretty sure based on the straightness and regularity of branches, though deciduous was in the area), but I have to confess to struggling with identification when they are alive let alone dead. So was it some random fluke that these few trees did not burn well, was it a specific type of tree that did not burn well, or was there some other factor I am missing? For those of you not familiar, it is just over the Ontario border and is I believe considered the bottom tip of the Boreal forest. 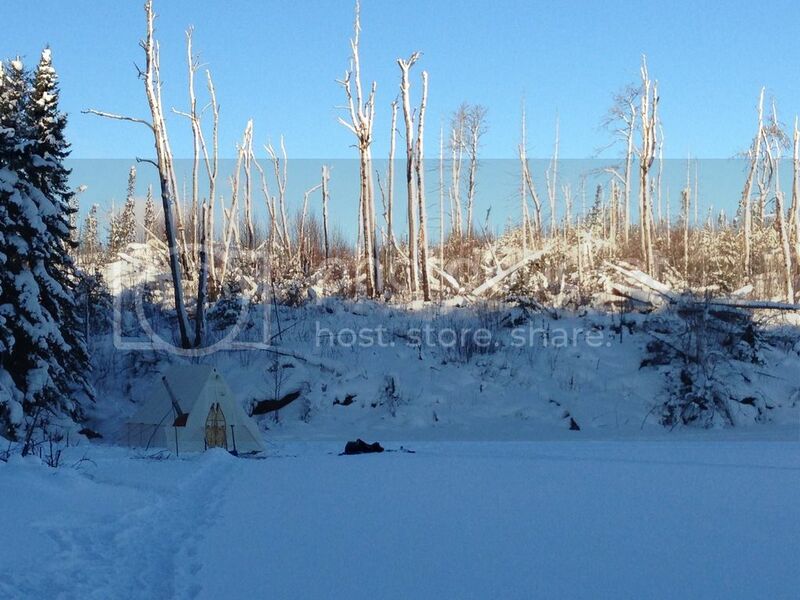 Below is an image of one of the areas I camped and the burn area next to it where some of this poor burning wood came from. If you want to use candles for light, this is about as easy as it gets. 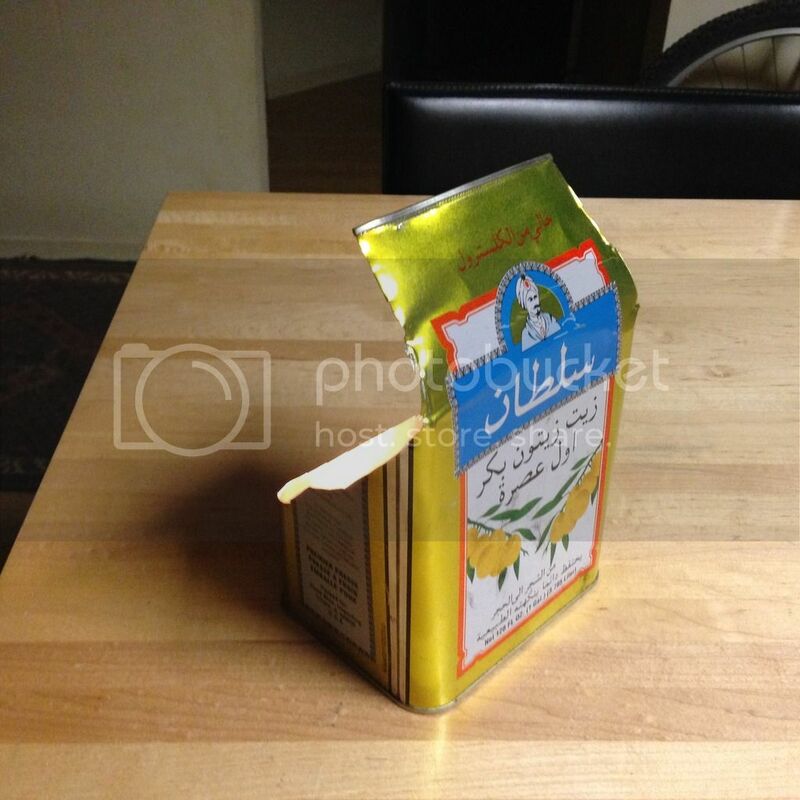 I just took an empty square can of my favorite Turkish olive oil and clipped it to shape. 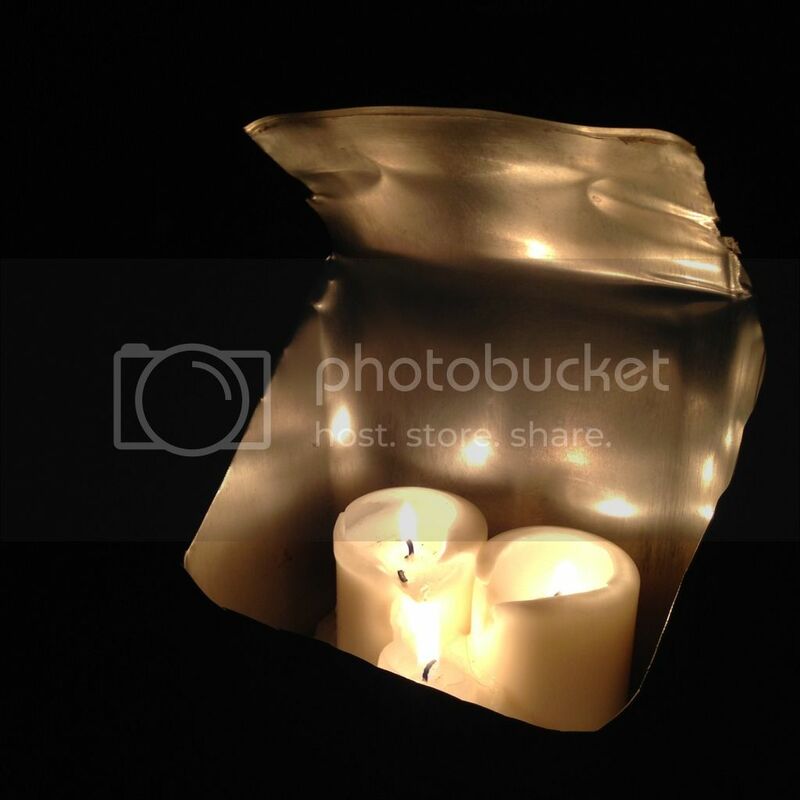 The inside holds 3-5 candles, and the top can fold down for transport, or be adjusted to direct light as desired. Crimping down the sharp edges is advised.